Halvas (plural halvades) is a Greek semolina pudding, variations of which are found in many cultures. It is one of the most simplest but delicious desserts. In order to make it you should remember the 1 2, 3, 4 ratio as follows: 1 cup fat (butter, olive oil, vegetable oil, ghee, or a mixture of butter and oil), 2 cups wheat semolina, 3 cups sugar, 4 cups water. Once you have mastered the basic form of halvas, the combinations you can make are endless (see my creations in the links provided at the end). You can add any kinds of nuts: almonds, walnuts, pistachios, hazelnuts, cashews etc, fruit: fresh, dried or preserved, and to sweeten it apart from the simplest sugar syrup, you can add honey, petimezi (concentrated grape syrup), carob syrup, or any other syrup yo like. 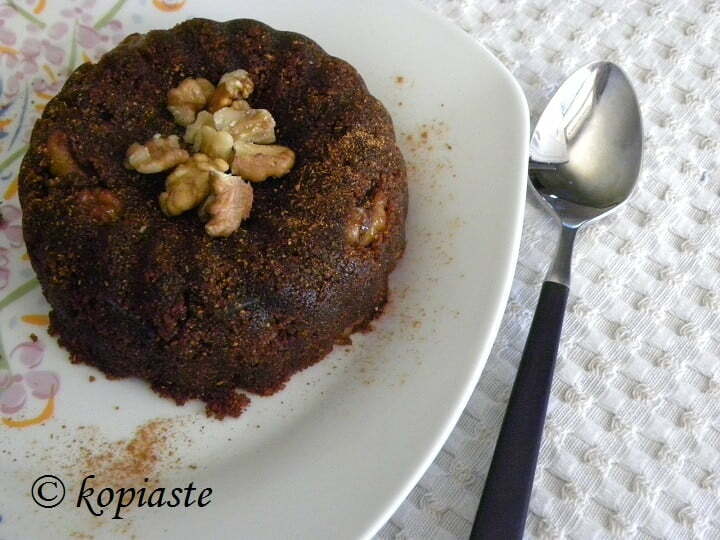 You can also make a chocolate halva by adding cocoa or chocolate in the pudding or just cover it with chocolate. Although I have made many kinds of halvades, you have not seen the last one, as I still have a few more ideas to try. My today’s recipe is made with a mixture of olive oil and butter, walnuts and petimezi, which is a concentrated grape must syrup. The butter is added in moderation but is enough to give a richer taste and the petimezi, apart from adding its unique taste is packed with antioxidants, vitamins etc. The addition of olive oil, walnuts and cinnamon add a plethora of impressive health benefits as well. The addition of the watermelon rind preserve is optional but if you have tried it, you know what an amazing taste it has, plus it gives a lovely crunchiness to the dessert. In a small pot prepare the syrup by boiling all the ingredients for 2 minutes. Discard the cinnamon stick. In another medium pot, heat the olive oil and butter and roast half of the walnuts for a few minutes. Add the semolina and stir constantly for a few minutes until it starts to slightly brown and roast. Add a pinch of cinnamon, mix, remove from the heat and add syrup. Mix in the watermelon preserve and put it back on the heat, mixing until it starts to bubble. Remove from the heat and cover the pot with a napkin until all the syrup is absorbed and the pudding sets. Place in a one litre mold and/or in five smaller molds and let it cool before placing in the refrigerator. Unmold in a platter and serve with a sprinkle of cinnamon, coarsely cut walnuts and with a drizzle of more petimezi on top. As I have already informed you, my blog has been nominated by BHMAGourmet for an award, in the category “Best Greek cooking in English”. If you like my recipes and have not yet voted, you can still vote for my blog until the 14th of December, 2015, here. We still have to participate in two challenges which will be judged by a committee. One of the challenges is to make frugal recipes which are nutritious and full of flavour and the other category is to make good use of our leftovers, so my today’s recipe falls in that category. You can find my Greek recipes in my cookbooks «More Than A Greek Salad», and«Mint, Cinnamon & Blossom Water, Flavours of Cyprus, Kopiaste!» both available on all Amazon stores. Read more here. A delicious looking dessert. Wonderfully seasonal. They look quite like X’mas pudding. I like the use of watermelon rind preserve here, Ivy.